I went to the zoo last week. That's something that most people that know me well might be surprised to hear. As an animal rights campaigner, those close to me know how I feel about zoos. I don't like them; I think animals deserve better than to be held captive for their lifetimes so that we can kill a few empty hours on a Saturday afternoon by looking at them. No matter how hard you stare at a gorilla, he can't teach you about conservation. Despite not being a fan of zoos, in my role as director of a charity which campaigns against the keeping of animals captive, I have probably seen the inside of more zoos than the average member of the public. I have seen endless photographs, hours of video footage, many transcripts of conversations and interviews, news articles, scientific papers and books published by and for the zoo community. I have, of course, also visited zoos over the years. From these various sources, I have learned an awful lot about the zoo industry. But what I have learned about animals in my lifetime so far, I did not learn from the zoo. I don't claim to be an expert on all things animal but I have spent the last ten years working with or for animals or conservation efforts. What I have learned, I learned from my own experience, books, papers, articles, photographs, documentaries and from others who have taken the time to share their knowledge with me. One of the rebuttals to my objection to zoos often comes from the parents of young children (and the zoos themselves, on behalf of their visitors with young children), who claim that children couldn't possibly learn about animals if they didn't go to the zoo. My response is normally to point out what a child cannot learn from looking at animals in the zoo. No matter how hard we stare at a tiger, we will not learn about his natural habitat, the vital role that he plays in his native ecosystem and the dire need for in situ conservation efforts if he and other members of his species are to survive beyond the next few decades. We could look all day at a polar bear and learn nothing of global warming and melting ice caps. We can admire orang-utans and come away non-the-wiser about palm oil plantations. We can marvel at chimpanzees and learn nothing of human-wildlife conflict and the bush meat trade. Of course, zoos can provide signs, guidebooks and talks to describe these things but what we can actually learn from looking at the animals themselves, beyond their size and shape, is debatable. And yet, animals are held captive for their entire lifetimes in zoos; purportedly so we can learn from them. I know what we cannot learn from zoos but perhaps, I pondered, I was not giving this multi-billion pound industry enough credit. When I visited the zoo last week, I decided to see what I could learn. I wanted to see exactly what it was that the zoo could teach me, rather than focusing on what it couldn't. So, somewhat helpfully following the same route as a couple of young families where the parents were talking about the animals to their children as they passed from exhibit to exhibit, I spent the day trying to understand exactly what it is that children might learn on a day out at the zoo. 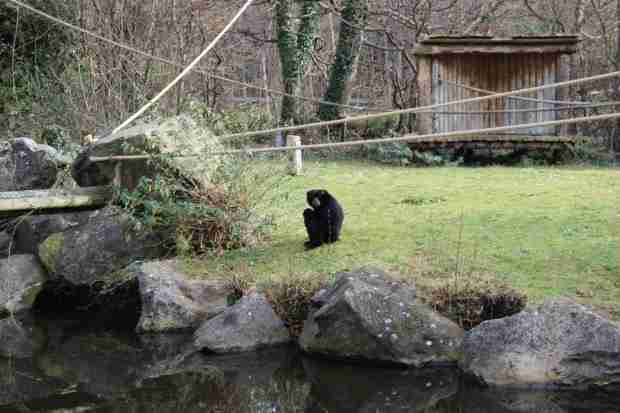 A lone gibbon sits on the ground at the zoo. Every primate that I saw at the zoo was sitting on the ground; something which is essentially alien to predominantly arboreal (tree dwelling) species such as orang-utans, gibbons and spider monkeys. The natural food source for these animals is high in the trees and many will spend the vast majority of their waking hours foraging for food high in the rainforest canopy. In the zoo, they sit on the floor, take the occasional wander around their barren climbing frame made of dead trees and stare dolefully at patches of ground, or pick at patches of their own skin. One macaque walked back and forth across a small bridge between his indoor and outdoor enclosure and twisted his head violently as he reached one end or the other. Head twisting in primates is considered a stereotypic behaviour which suggests psychological distress. One chimp sat on a raised platform in an indoor room. The mother of a young child standing next to me told her excited young daughter that the "monkey was having fun playing on the swing". 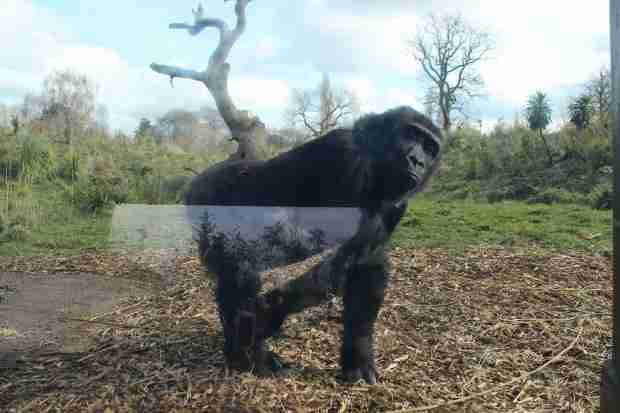 The ape was, in fact, demonstrating a disturbing behaviour indicative of mental trauma. He was repeatedly regurgitating (vomiting) his food into his hand before eating it all over again. He continued to do this for the ten minutes I stood and watched him. One lone gibbon sat on the ground on a patch of grass on a tiny island. Gibbons do not live on their own in the wild. In fact, private owners of primates in England can be prosecuted for keeping such social animals without any company of their own kind. At the zoo, I learned that these incredible aerial acrobats sit, hunched over, with their long arms wrapped tightly around their slender legs, staring sadly out at the people staring back, day-in-day-out. This little otter stared silently out of his small enclosure. 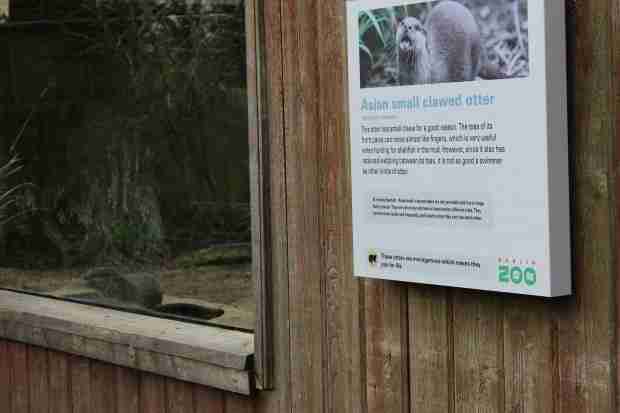 The sign next to him tells visitors how sociable otters are. The zoo taught me that otters live alone, need very little room and require barely enough water to swim a body length. Confusingly, the sign on the otter enclosure said that otters lived in big noisy groups and loved to communicate with each other. The otter I saw at the zoo was silent as he stared out of the glass window of his small enclosure. At the zoo, I learned that penguins can live in small groups, with a small pool of dirty water to swim in. I learned that it was ok for children to pat the penguins on the head, as the barrier was just high enough for them to reach over and touch the birds. 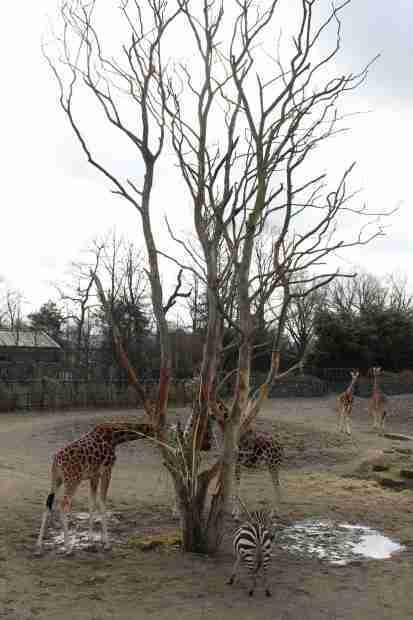 The zoo taught me that the African Plains look like a wasteland, with no greenery and the odd dead tree dotted around. 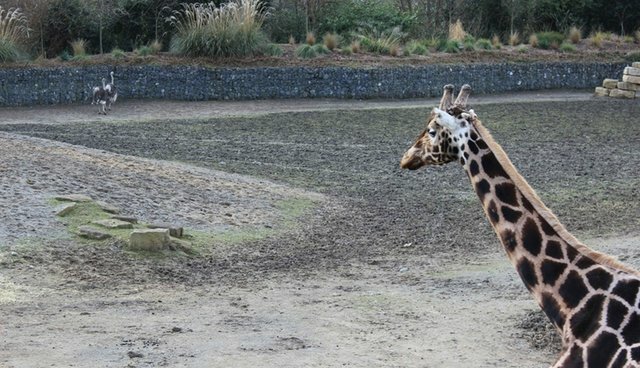 Giraffes eat dry hay from baskets and zebras live in pairs on desolate, muddy ground. At the zoo, I learned that tigers live in groups of three in spaces that can be crossed at a run within seconds. The sign told me that tigers love to swim, but the tigers in the zoo had little more than a dirty puddle to wet their paws in. The playground for children is larger and more complex than the permanent home of the orangutans. 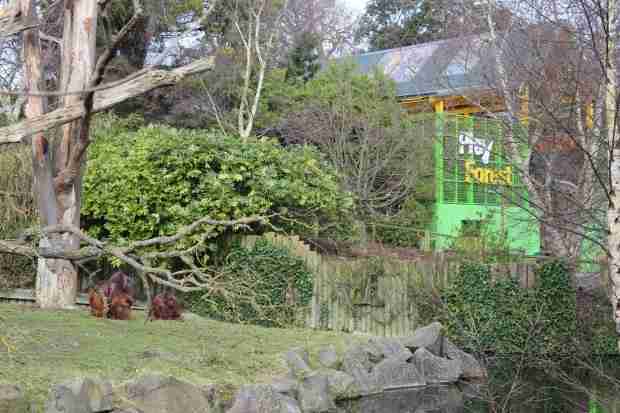 I learned that the play area for children in the zoo is granted more space, and better climbing equipment, than the enclosure in which the neighbouring orang-utans would spend their entire lives. I learned that elephants and gorillas could live in the cold European climate and that they don't need access to heat for most of the day. I knew this must be the case because the animals were locked out of their indoor enclosures during the time I was there. I learned that snakes can live in tiny glass rooms, with painted backdrops and fake rocks. I learned that bats could live in brightly lit rooms. I learned that tapirs, who are primarily nocturnal and native to the tropics, live in glass fronted rooms, sleeping on piles of hay during the day. If they venture outside, they can take advantage of their muddy, featureless outdoor enclosure with no greenery and a concrete pit full of water. Okapis, wolves and African hunting dogs live in barren fields. The zoo taught me that parrots live in cages, that flamingos only have one and a half wings and that hornbills live in brick buildings. I learned that elephants live in sandpits, that red pandas live on climbing frames in a space hardly bigger than the back yard of my terraced house in the north of England. I learned that sea lions could live in a swimming pool and that male elephants live on their own. The African Plains are a muddy waste ground littered with dead trees. My trip to the zoo last week brought home to me that, not only are we failing to teach children important lessons about conservation, empathy and respect for other living beings by taking them to the zoo, we are also presenting them with confusing and often downright false information about animals and their needs. I have long argued that zoos deliver a damaging educational message to children but I have never walked around the zoo trying to put myself in the shoes of a child; in the shoes of someone that has not already learned from so many other, much more reliable sources. What I learned from the zoo last week did nothing to teach me more about animals, but taught me a huge amount about our treatment of them for our own amusement. For those that are interested, the zoo I went to last week happened to be Dublin Zoo; the most successful visitor attraction in Ireland. Though I firmly believe that the lessons learned that day could be just as applicable to any number of other captive animal businesses.